The Japan Science Museum Association (JASMA) is one of the biggest networks of science centers and museums in Japan, with about 190 members nationwide. The objective of the association is to promote science communication activities and STEAM through regional science centers’ traveling exhibitions, workshops, training program, and more. For 2018, JASMA initiated many activities to promote the United Nations’ Sustainable Development Goals (SDGs) during its annual meeting in June 2018. Our target was not only Goal 4 (Quality Education), but we also addressed Goals 1, 3, 6, 7, 8, 9, 11, 12, 13, 14, 15, 16, and 17. The first step was to promote awareness of SDGs for museum members and how they need to consider the link between local science museum activities and the SDGs’ 17 objectives. JASMA provided opportunities for presentations on the SDGs and to create plans with members in 2018. As a second step, JASMA offers a good-practices platform. JASMA has created a special website for SDGs that is available for all members to share ideas with colleagues. Our activities involve JASMA members from Hokkaido to Kyushu, and after few months, many good practices were posted on the website. We’ve showcased local efforts in helping to share knowhow and links with SDGs that leads to further promotion and progress for all. Continuing such activities contributes to the Tokyo Protocol that proposes roles of science centers and science museums worldwide. Since concluding the Tokyo Protocol, JASMA is supporting the awareness and contribution for SDGs to strengthen public engagement in global sustainability through the collaboration with JASMA’s nationwide network. 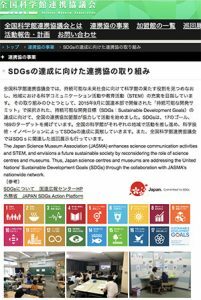 We need more collaborative initiatives with more stakeholders to accelerate SDG-related activities at each science center/museum, and thus further advance the Tokyo Protocol and the International Science Centre & Science Museum Day.